Let’s Face It. Full, natural eyebrows are in! With EES – Essential Eyebrow Solution® you can maximize eyebrow volume and get the full, natural look you crave. 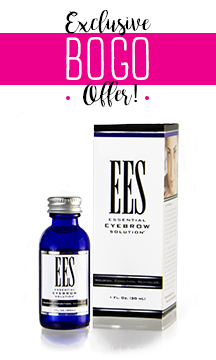 EES™ is a clinically-tested formula that gives you thicker, fuller looking eyebrows with every use. No cosmetics, no painful tattoos, no transplants. It’s the real you – with EES™. Infused with the natural botanical black cohosh, EES™ is a patented formula that nourishes brows to help support lasting fullness, conditions brows to promote strength, suppleness, and shine, and revitalizes eyebrow hair, resulting in the appearance of thicker, fuller eyebrows. Optimal results will typically take 120 days (one complete eyebrow growth cycle). I tell everyone about the "eyebrow” solution that I used. It worked! I found that with the “gift of aging” my eyebrows were really looking sparse. My esthetician told me about the EES product and I’m so happy she did because it really works! I would highly recommend this product to anyone that would benefit from its use. Using it is simple; it does not irritate your skin and gives you back some of your confidence. I've been using EES as part of my daily routine to keep my eyebrows looking beautiful and natural. I love this product! Being able to keep my eyebrows enabled me to feel more normal, like myself and "keep myself". As "myself," I can conquer anything! The eyebrow solution was so easy to use. I just incorporated it into my daily routine.